A some time theme of articles on Bella has been people’s journey from DON’T KNOW to YES. The passage from ABSTENTION to YES has just as much to offer however. The possibility of abstention has been a real one for some Scots of the anarchist persuasion, who don’t participate in the electoral process. Not only is this not an election, though, but we’ve reached a glorious stage in our political consciousness in that there is in fact nobody left who can say they don’t care about this vote. This sentiment, while from a republican (or federalist?) stance, still reflects the thinking of the self-confessed Glasgow Anarchist who wrote the quote above. Corollary to this, it appears that there is less need for anyone to use the word ‘anarchist’ at all. You’ll see the word anarchist quite a bit in this article, but it will be the only place you’ll see it in this debate. It’s not that Scottish anarchists have avoided indyref, it’s just that they’ve been more at home with it than many, because they have been talking about ideas for new societies all along. There is also among Scottish anarchists, some reasonable doubts concerning just how rosy the future will be in an independent state. This is because it is a mainstay for anyone who cares about class struggle politics that they be opposed to both Scottish and British nationalism, as nationalism is seen as binding people to the capitalist nation-state, reinforcing everyday exploitation. The unknown future is a great place in which to speculate on more equal societies, but anarchists as you are aware still believe that what passes as representative democracy in the world today is a front for class oppression, generally by corporate interest. This leaves the question as to whether in practical terms, an anarchist should vote YES or abstain. I should add quickly that there appears to be no reason for an anarchist to vote NO, and nor have I have heard of anyone identifying with anarchism who is voting NO. Of all the groups I contacted in Scotland, numbering over 1,000 individuals, I obviously couldn’t find anyone that supported a NO. However, I am writing this because I have come across some who are still considering abstaining. This isn’t entirely great news for the YES campaign, because with the polls pitting the race as close as they do, it looks like an abstention will be as good as a NO on the day. Traditionally, and within whichever associations they form, anarchists in Scotland, as elsewhere, have always been organisers. Some of the people that have undergone a political awakening and signed up to groups like The Common Weal which gather around catchphrases such as ‘participatory democracy’ are in general not aware that the anarchists among us have been organising real community action for a long time. Now, and thanks to this referendum, anarchists have joined with Radical Independence Campaign, and Radical Independence has been fortunate to have the benefit of their experience. The Radical Independence Campaign, and radical independence in general, has reduced the need for the label ‘anarchist’, and this may be a good thing. Anarchism isn’t discussed much as a concept. As a name, title or descriptor of any sort, ‘anarchist’ isn’t popular with the people, and it isn’t popular with political parties, but when there is such a large crossover as there appears to be between anarchism in Scotland and the radical independence movement, it’s worth a closer look. As you are well aware we’re not talking about an election here. Political parties, fortified with notions of their own dignity, have yet to spoil this referendum debate, which is why it’s been such a high quality debate. We’ve been asked to imagine what Scotland will be like as an independent country, and the imagining has been done entirely by the YES campaigners. One of the slogans of the National Collective arts group has been just that — Imagine a Better Scotland. Politicians have done what they always do and protested the abhorrence of the views of their parliamentary rivals, but politicians defend their points merely to be singular in defending them. They don’t do imagining. YES campaigners ask you to imagine what defence, equality, health, or the economy might look like in a newly independent country — and there is more to it than that. We may take any aspect of our lives and imagine how it may develop. Much more imagining is possible than we are used to. This is why some anarchist ideas are now being heard, whether they are labelled anarchist or not, because imagining is what anarchists do. These are sketches of a few ideas from a much wider variety of anarchist aims, and here is a disclaimer which will set the record straight on anarchism in general: There is no anarchist consensus about independence movements in Scotland or anywhere. There is no anarchist consensus at all, as anarchism isn’t programmatic like other political philosophies. Anarchist associations are real, but sometimes people within them don’t even identify with the word anarchism — that’s just how it works — so in saying ‘anarchists’ in this article I am more correctly referring to those who may identify with some or various anarchist goals or aims. I am not speaking for anyone or any one group, although I have canvassed anarchist groups in this country, and individuals within these groups responded, speaking on behalf of themselves. Back to practicalities then, and the anarchist journey to YES balances the idea that anarchists don’t like the idea of nations, against their tendency towards localisation. Ironically, when it comes to nation states, it is sometimes felt that the breaking down of national boundaries makes the boundaries less relevant. Here are some of the opinions I have canvassed. Do you view independence as a state towards breaking down power structures, or do you support devolution as a move towards more democratic federal structures? My road to anarchism began long ago when I became a socialist, and I did so after reading the prison writings of Bobby Sands, so I can’t help but sympathize with independence movements. Anti-imperialism is something I can get behind, even when it’s not anarchist. The recurring argument is that instead of creating new border, we should destroy them. A government holding his power on millions of people is not going to leave it any soon. However, when all the smaller states will start to fight for their own independence, it is only a matter of time before the people then overthrow their own state government to create even smaller state. I feel like independence would only replace a system of dominance by another with the main difference being that it has a similar culture than the majority of its oppressed populace. It seems to me that it is a fight for a frontier not a liberation. With a closer government, it is easier to protest authority. I support nearly anybody fighting for the autonomy of their own community. It decentralizes power and keeps the will of the people as closely aligned to actuality as possible, while still functioning as a united state. I suppose, fundamentally, if you’re going to have a state, it might as well be as small as possible, for the sake of being as accountable as possible to its people, for smaller structures to have to devolve, and to expose the violence by which other states manipulate its constituents. Rather than simply repeat long-standing principles, however, we need to articulate some kind of an analysis and ask ourselves how potential state reorganization will affect us and the wider class struggle. What is key to this report is the questions as to whether anarchists even should be involved in this issue, and the fact that it is perhaps a good opportunity to remind people of their aims. As anarchists, we obviously shouldn’t argue for voting but nor should we fetishize the act of not voting. Of far more importance is that we are outside of the narrative and critique all political managers. Critiquing political managers is necessary but I question placing anarchism outside of the narrative. It might be wise to place the word anarchism outside of the narrative, but not anarchist values because these values are manifest in people, all of whom are dedicated to change. Radical Independence campaigners on Scottish doorsteps have discovered afresh that everyday life is almost entirely anarchist. Voluntary arrangements and understandings prevail almost everywhere — but tell the people that it’s anarchist to want to co-operate on an entirely local level, and you’ll find that the label is sometimes not helpful. In absence of the word anarchism then, there is some huge crossover between local Anarchist Federations in Aberdeen, Inverness, Dundee, Glasgow and Edinburgh, and the Radical Independence movements in these places. It is held of anarchists, that they don’t participate in the electoral process, believing that parliaments provide a facade behind which the business of managing capitalism goes on. However, anarchists have no problem voting. Anarchists vote all the time because they understand that the process of finding out how many and how few people want to do something is essential. The electoral process is something different and means leaving decisions that will effect many people to a few leaders or bosses. To this extent anarchism is real democracy. Central to anarchist politics is the idea that everyone effected by a decision should have their say in making that decision. Anarchists oppose government elections because these elections are about choosing rulers rather than ending the division into rulers and ruled. Therefore I would argue that this referendum is the exact kind of popular vote that anarchists have always longed for. Practical anarchy has never depended on total local self-sufficiency. But many anarchists argue that communities and regions should be as self-sufficient as possible, so as not to depend on distant, impersonal outsiders for necessities. Is it beginning to sound a bit more like indy? I think it is. Even with modern technology which was designed to enlarge commercial markets and destroy self-sufficiency, much more self-sufficiency is possible than governments and corporations want us to know. Some of the goals articulated by Scottish equality campaigners during the referendum have been iterated by anarchists for a long time. Anarchists are more serious about these ideas than their hearers have ever been apt to believe, possibly because the ideas are often given labels which make them sound seditious. Anarchist comments reflect the ease with which the radical YES campaigners are so alive because for the first time they are excited about personally organising a new society. While an independent Scotland will still have politicians and bureaucrats who decide things for other people, it will be yet be closer to anarchist ideals — a local community, in which people share common knowledge of their community and its environment, where they will have to live with the consequences of their decisions. Unlike politicians or bureaucrats, who decide for other people. I’m all for it. I see the further decentralisation of democracy in a largely leftist country as a move anarchists should support. While Scotland may be no better off under independence, a vote for YES is yet a positive step towards the sort of localism which anarchists would like to see characterise the coming century. While some anarchists are ignoring the referendum as a sham, considering that voting either YES or NO is promoting the statism they oppose the most, I’d argue to them that the possibility of a YES result opens the door to a localised globe ever so slightly wider, and could be a step in the right direction towards an entirely localised voluntary and cooperative society. We will help those who are poorer or having a shite time. Without promise or punishment by an exterior moral arbiter. I think the concept is something we could possibly strive towards. I think that an Independent Scotland needs as many voices as possible. I can appreciate both perspectives. Independence is not the solution to the issues but “widening the floor of the prison cell” as Chomsky put it. The journey to YES, therefore, should be straightforward for anarchist groups, whom in general believe in localisation. The ideas that the referendum vote is another way to snare or divide us, and that it is a social exercise to widen the floor of the prison cell, are both real, but they are more than balanced by the possibility that by voting in association with the rest of our country, we are effecting a change in local values. For those that may be planning abstention, now might be the time to consider a vote for solidarity with the many people who have begun in the last years to share views which in some cases anarchists have felt to be their own. I quote Christie, from an article in the La Rioja newspaper, from Northern Spain. It is this sort of practicality that I am also forwarding, and I think any potential abstainers should read Stuart Christie’s article and consider it. Anarchism has always been global, and has through history focused on workers’ direct and democratic control of society. I think this kind of aspiration has often been expressed in the last year of YES campaigning in Scotland. 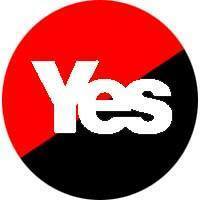 That’s my wonky wee Anarcho-Syndicalist Yes logo at the top there! Sad I know, but I cant help feeling slightly chuffed that it’s made it onto Bella Caledonia. Sorry, ego trip done, back to the salient points, as you were. Although not all anarchists have agreed on their attitude towards the referendum, nevertheless, anarchists have played a vitally important part in the Radical Independence Campaign from day one of that movement, and have played a vital role in helping to ensure that the wider Yes campaign as a whole is the self-initiating network of groups and individuals that it became, rather than something organised on a top-down basis like political parties. I would imagine all Anarchists are supportive of the YES campaign for all the above reasons- a key opponent of Independence has been from the Marxist-Communist ‘Internationalists’ who predictably view it as betraying the working classes in Newcastle, Liverpool blahblahblah…you get the drift by now. Another factor is how these communist groups cling to notions of centralization, Statism & above all else authoritarianism, which of course ideologically separates them from Anarchists- for that reasons it can be problematic to associate Anarchism with ‘communism’ as it can generate a lot of misconceptions & misunderstandings. All ‘groupings’ for Anarchists are potentially authoritarian if they become ‘institutionalized’, or made permanent; this is when it risks becoming a power structure & polluted with authoritarianism- grouping ought to be for a purpose, not a purpose in & of itself. Anarchism is always a process. I would certainly object to any representative democracy & as an anarchist would advocate direct participatory democracy of temporal assemblies within local communities. Personally I would vote YES as it brings a smaller state closer to democratic accountability, may energize localism, facilitate democratic participation & mortally wound a large aggressive British State. – I don’t think Scotland is, at all, a ‘largely leftist country’, and indeed think that this is left-centric thinking when it appears from people on the left. People might be fiscally redistributive in their outlook, to the point of being moderately left-of-centre, but it’s obvious that most citizens’ ideas about social justice in Scotland can’t be easily compartmentalised – and are probably more fragmentary than alot of people think. I suspect we’re going to see where the majorities really sit in the post-referendum party-shifting/forming that’s going to inevitably happen with a party realignment after independence. – It should be perhaps, but it’s not (speaking as an anarchist). I believe in localisation – but the whole point I think of anarchist ideas of localisation (from Proudhon onwards, though they frequently differ) is the idea of the smaller social unit of organisation, within a mesh of federated associations. There is not even a remotely symmetrical picture between this idea, and anything that will emerge post-referendum. I don’t think it’s plausible that reducing the net area that a government can administrate makes a government more local, or more accountable. Devolved and localised institutions will ultimately serve the state function they were designed to perform (Rudolph Rocker has a great analogy for this), and there will always be that tension between central power and local instutituion – between the local and the central. Ultimately – I think decentralised authority under capital/state operates only to diffuse power, but not with any different a function. And since diffuse state power is antithetical to the ‘smaller unit of organisation’, I’m not as enthusiastic about the possibilities folk think decentralisation involved. There’s legislation coming through (such as the ‘Community Renewal Bill’) that aims to put into place asset-transfer mechanisms for communities. And while this is a good thing, guess who has the final decision on that? Yep, central government. No-body can stop someone describing his political views as anarchist. It is time that the author jettisoned his emotional baggage to nationalism. Alas unable to read Spanish the Christie link is not available to me but let us be clear that much of Catalan nationalism as in Italy with the Northern League is driven by the right wing determined to jettison the poorer regions of Spain and Italy and lessen the tax burden upon the local capitalist class. Hardly the class solidarity espoused by anarchism. Anarchist principles are important otherwise you degenerate into those who call themselves National Anarchists who employ liberatory phraseology to justify racism and apartheid localism…white supremacy tribalism.